There are upsides and downsides to having a hearing condition rare enough that treatment outside one’s own geographic area is prudent and necessary. I think the downside is obvious: uh, I can’t hear out of my right ear. The upsides include regular travel to a place with new (to me) restaurants! And so, off I’ve traveled, with various partner- in-crime, to downtown Syracuse over the past month for my treatments and delicious treats. Last week, Melinda was my squire, and after my less-than-fun treatment, we scooted down to Armory Square’s excellent kaiten-style sushi joint, Sakana-Ya. 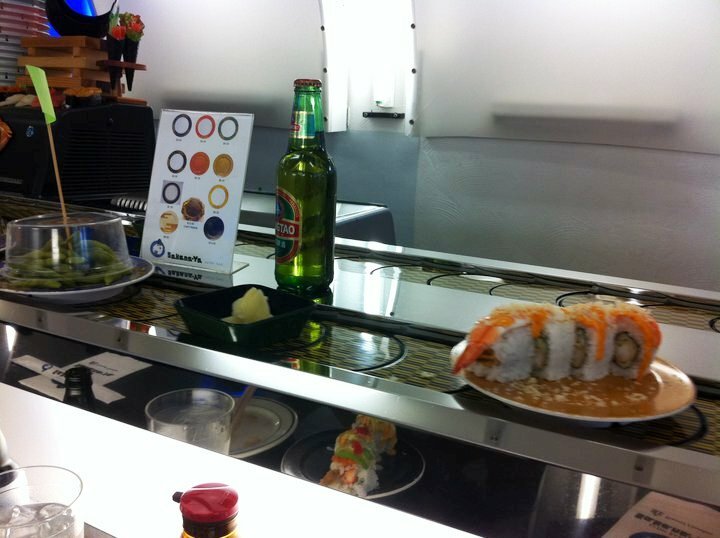 Kaiten refers to a service style rather than the food itself. Sakana-Ya, like many cosmopolitan sushi bars, offers its dishes cafeteria-style via a conveyor belt that runs past all diners and lets them choose by price and presentation what they’d like to eat at any given moment. I started with a bottle of Saporro beer, while Miss Smartie Pants took advantage of the offering of a nearby tent card: Zipang sparkling sake. Served in a tiny shot glass, the Zipang was dry, champagne-like and delicious. We also ordered some beef gyoza from the waitress, as hot items are not delivered via conveyor. 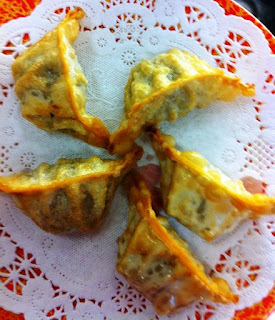 These fried delights were filled with beef and rice noodles, and the accompanying dipping sauce was mild with a hint of fish sauce. Next up, a gigantic soft-shell crab roll with spicy mayo and avocado that was so plentiful, a single piece was difficult to cram in my mouth. Difficult, but not impossible, of course. 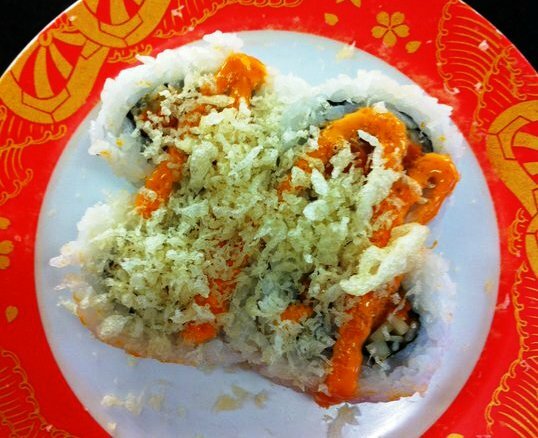 This hit the spot: hot, luscious and fresh – everything you want in a sushi roll! 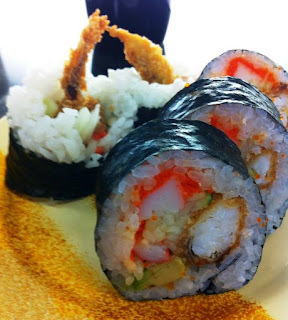 Then we grabbed a fried shrimp, crabstick, tobiko and avocado masterpiece wrapped in nori. I liked this one a lot, although Melinda was less of a fan. 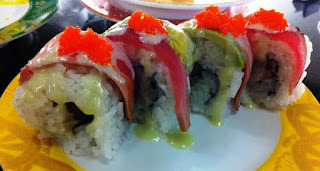 To be sure, the mouth-feel of a nori-wrapped roll is much different than a california or tuna roll. But nori has a cool, salty taste, and unique texture that plays against the soft rice and fried fish that I dig. 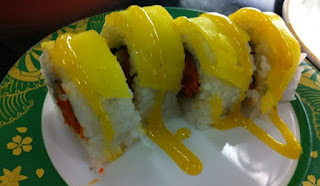 ﻿ For a while, we had been watching a yellow-topped roll truck on past us. Theories ran from egg to mango. Mango won, as did we when we sampled this unique spicy mango-topped creation with spicy tuna. It was unctuous and different, with sweet to balance the spice. A great combination. I next grabbed roll a little more on the sophisticated side: a tuna roll draped in more raw tuna, with fish roe and avocado. There was no spice to this, just tons of umami – the fifth, savory taste – and tiny roe to pop in my mouth. Melinda did not groove on this gem at all, so I got to savor every bite. 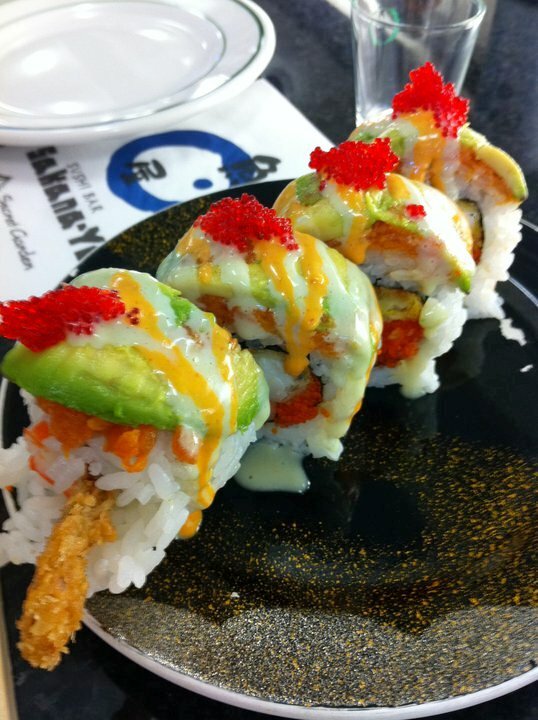 All the goodies: tempura fried shrimp, a little avocado, fish roe, spicy mayo and some other yummies we couldn’t even name. This offering is pure enjoyment, and one to grab if it’s rolling on by you. Sakana-Ya is not fancy. Come as you are, eat what you like, and have some fun shopping at Urban Outfitters next door when you’re done. This is a daily kind of sushi place, where you don’t need a special occasion to get your raw fish fix. We graded it a 6.5 on the BHS scale, and I will keep it on my list of Syracuse favs. I’ll be back to the Salt City next week for another treatment, and you can bet I’ll be demanding some good eats following my ordeal! BTW, I was up in NNY and hit Ryan’s Lookout last weekend. It’s still one of our family darlings in the Northcountry, and I hope you have a chance to stop by before the season’ over. We had a fried goat cheese and black raspberry appetizer there, served on crispy, crunchy crostini. It was sweet, savory, ooey, gooey, warm, cool and satisfying. What more could you ask for from a cheesy starter? My personality is big, but my hunger is bigger!